Izaac Urias is the first of his family to dive into the Real Estate business. Izaac believes it's important to stay active and portrays this belief with a variety of hobbies. Some of those hobbies include, surfing, skateboarding, snowboarding, photography and videography. He is also very passionate for Real Estate and wants to give his clients the best possible experience when it comes to buying or selling a home. He will be working out of the Del Mar office. 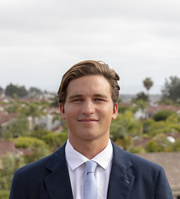 With a Business Administration degree from Point Loma Nazarene University, Izaac has made it his goal to help others find their next place to call home. Serving San Diego County, Izaac works with Buyers and Sellers on making their move smooth and easy. He holds in high acknowledgment both the emotional and financial needs of his customers. Izaac will be focusing mainly in Cardiff-by-the-sea, but also throughout Solana Beach, Encinitas and Del Mar. Through positivity, relentless work ethic, and dedication, Izaac looks forward to help facilitate your next real estate transaction.